We arrived at out cabin in Springdale, Utah Tuesday evening, September 29th; settled in and walked down Springdale’s main street to have some dinner at one of the many interesting cafés and restaurants. 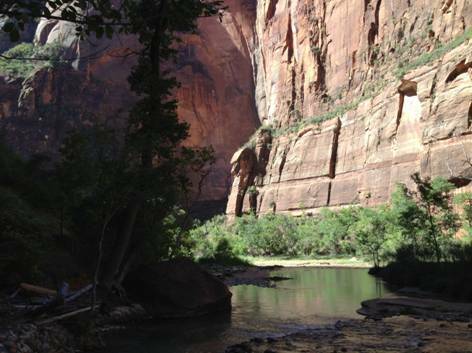 Springdale is nestled in and directly adjacent to the south entrance of Zion National Park. The town has managed to maintain a high quality, non-glitzy appearance despite the high volume of activity concentrated on its main thoroughfare. Shuttle busses run on a very frequent schedule between the motels, eateries, and shops up and down the main thoroughfare. The northern most stop on the Springdale shuttle route is a very short walk from the entrance to Zion National Park. Driving of personal vehicles within the Park itself is strongly discouraged by the Park Service during the lengthy tourist season. However, a very convenient shuttle system within the Park makes one totally comfortable with leaving the driving to someone else. So, Saturday morning we boarded the Springdale shuttle for a five minute ride to the Park entrance, picked up some Park literature at the Visitors Center, and headed off to the Zion Canyon shuttle stop. 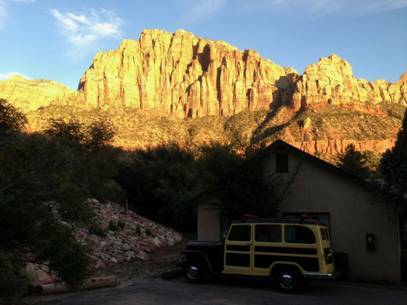 The Zion shuttle stops at eight locations within Zion Canyon. 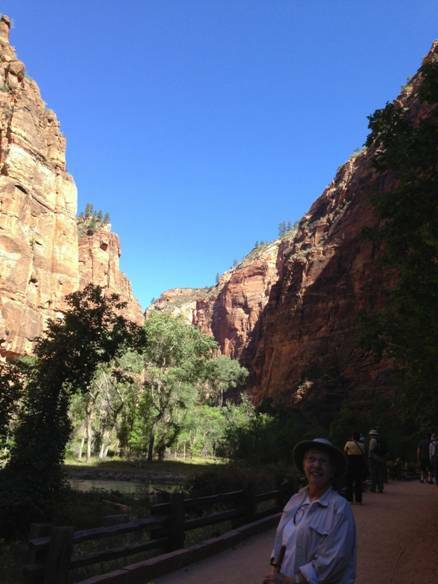 As suggested by the Zion shuttle driver, we elected to start our tour of the Park by taking the shuttle to the furthest stop, a 15 minute ride to the north end of the canyon – The Narrows. At this stop one can take a non-strenuous one half mile walk up the canyon to a point where it narrows sufficiently that one must wade up the North Fork of the Virgin River to continue further. We found it sufficiently impressive just looking up the narrowing canyon and at those wading further up stream. 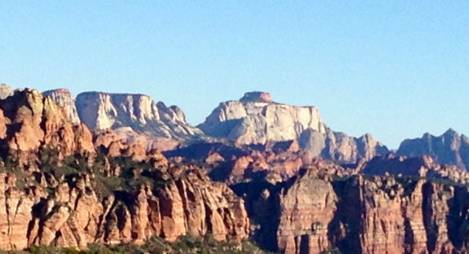 It is interesting to compare the Zion Canyon to the Yosemite Valley. Whereas, as reported in a previous blog entry, the shear stone walls of Yosemite Valley are light grey granite and quite smooth, the walls of Zion Canyon are coarse sandstone and multi-colored. 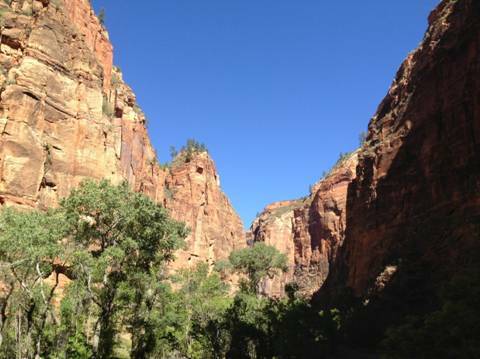 Zion Canyon is much narrower than Yosemite Valley and the base of the walls even more accessible. Each location has its own special attractiveness. After visiting the upper end of Zion Canyon, we proceed back south toward the mouth of the canyon on the Zion shuttle, soaking in the views of the canyon as the shuttle made its designated stops at places such as “Big Bend”, “The Grotto”, “Court of the Patriarchs”, and Zion Lodge. We stopped at the Zion Human History Museum” where we saw exhibits of and watched a video presentation of the history of inhabitants in Zion National Park throughout the ages. Life was difficult for late settlers in the canyon; with alternating periods of drought and raging floods. Few stayed. After taking the Springdale shuttle back to our cabin, “we” decided that it would be “interesting” to drive 15 miles out of Springdale and up Kolob Terrace Road (operative word being “up”) as far as we could before having turn around and return back to the cabin before dark. We chugged our way up Kolob Terrace Road (mostly in 2nd gear) to an elevation of about 7,500 feet – 3,500 feet above Springdale in about 12 miles. The sights were striking, but I was too worried about the stress on the Jeep (particularly with engine overheating tendencies) to enjoy the view. Jean, on the other hand, with her unflappable confidence, loved every minute of the drive. We concluded our stay in Springdale with an evening meal consisting of turkey sandwiches and roasted almonds on the lawn of our cabin complex as we watched the shadows grow on the red canyon walls.